In the sixth novel in the acclaimed Sean Stranahan mystery series, Montana's favorite detective finds himself on the trail of Ernest Hemingway's missing steamer trunk. When a woman goes missing in a spring snowstorm and is found dead in a bear's den, Sheriff Martha Ettinger reunites with her once-again lover Sean Stranahan to investigate. In a pannier of the dead woman's horse, they find a wallet of old trout flies, the leather engraved with the initials EH. Only a few days before, Patrick Willoughby, the president of the Madison River Liars and Fly Tiers Club, had been approached by a man selling fishing gear that he claimed once belonged to Ernest Hemingway. A coincidence? Sean doesn't think so, and he soon finds himself on the trail of a stolen trunk rumored to contain not only the famous writer's valuable fly fishing gear but priceless pages of unpublished work. The investigation will take Sean through extraordinary chapters in Hemingway's life. Inspired by a true story, Cold Hearted River is a thrilling adventure, moving from Montana to Michigan, where a woman grapples with the secrets in her heart, to a cabin in Wyoming under the Froze To Death Plateau, and finally to the ruins in Havana, where an old man struggles to complete his life's mission one true sentence at a time. 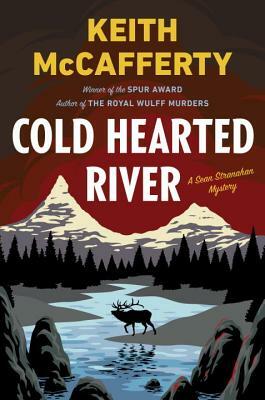 Keith McCafferty is the survival and outdoor skills editor of Field & Stream and the author of the Sean Stranahan mystery series, which includes The Royal Wulff Murders, The Gray Ghost Murders, Dead Man’s Fancy, Crazy Mountain Kiss, which won the 2016 Spur Award for Best Western Contemporary Novel, and Buffalo Jump Blues. Winner of the Traver Award for angling literature, he is a two-time National Magazine Awards finalist. He lives with his wife in Bozeman, Montana.